SportsLine's advanced computer model simulated NC State vs. Hofstra 10,000 times. The opening round of the 2019 NIT tips off Tuesday, including a matchup of major vs. mid-major as the NC State Wolfpack host the Hofstra Pride at 7 p.m. ET. The Wolfpack (22-11) are favored by nine at home over the Pride (27-7), with the over-under for total points scored set at 163 in the latest NC State vs. Hofstra odds. 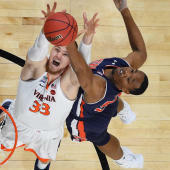 Both teams wound up in the NIT 2019 after disappointing finishes in their respective conference tournaments. North Carolina State was blown out by Virginia in a game that almost certainly would have gotten them into the NCAA Tournament had it won, while Hofstra lost in the conference title game after winning the CAA regular-season title. Before making your first-round NIT predictions, see the Hofstra vs. NC State picks from SportsLine's Projection Model. Now, the model has honed in on NC State vs. Hofstra. We can tell you it's leaning under, but it also has a strong against the spread pick that hits in well over 50 percent of simulations. You can only see that one at SportsLine. Entering Tuesday night's matchup, the model knows that NC State will be looking to use its superior speed and athleticism. The Wolfpack have five talented guards in their rotation and use them to push the pace, ranking 41st in the country in adjusted tempo. Torin Dorn is a slashing 6-foot-5 wing who averages 13.4 points and 7.1 rebounds to lead the category, while Markell Johnson, C.J. Bryce, Braxton Beverly and Devon Daniels all average at least 9.2 points per game as well. Against a Hofstra squad that ranks 189th in adjusted tempo, look for NC State to use its guards to control the speed of the game and ratchet up the intensity past the point of the Pride's liking. Johnson figures to be particularly important as the team's leader in assists and NC State's best shooter. But just because the Wolfpack may control the tempo doesn't mean they'll cover the NC State vs. Hofstra spread. The Pride hit 38.9 percent of their attempts from beyond the three-point line during the season. That was the 13th-best mark in the nation and they even kicked it up a notch during CAA play by hitting 41 percent of their attempts to lead the league. Justin Wright-Foreman is one of the most electrifying guards in the NCAA, scoring 27 points per game while grabbing 4.0 rebounds, dishing out 2.9 assists, and shooting 42.9 percent from three-point range. However, Wright-Foreman doesn't do it alone, as Eli Pemberton averages 15.4 points per game. Hofstra also is second in the nation in free-throw shooting percentage. Who wins Hofstra vs. NC State? And which side of the spread hits in well over 50 percent of simulations? Visit SportsLine now to find out which side of the Hofstra vs. NC State spread you need to jump on, all from the model that has crushed college hoops, and find out.